Nassau County Executive Edward P. Mangano and Health Commissioner Dr. Lawrence Eisenstein offer tips to safely prepare your Thanksgiving Day turkey. Nassau County, NY - November 19th, 2013 - Nassau County Executive Edward P. Mangano and Health Commissioner Dr. Lawrence Eisenstein offer tips to safely prepare your Thanksgiving Day turkey. Each year, many cases of foodborne illnesses are reported during the holidays due to improper preparation or storage of turkey. Fresh turkey: Buy a fresh turkey within one or two days of planned cooking and serving. Refrigerate it immediately upon returning home. The temperature in the refrigerator should be 40°F or lower. 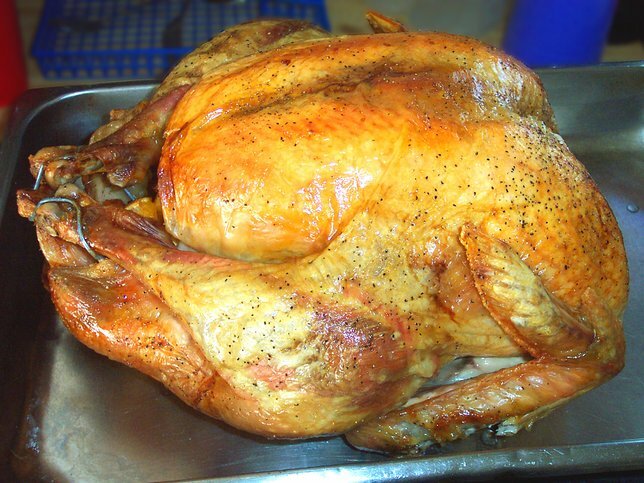 Frozen turkey: Turkey, which is frozen, should be stored in a home freezer at 0°F or below. Thawing time for a frozen turkey depends on its weight, and the method used. The preferred way to thaw turkey is in the refrigerator, at a steady, cold temperature of 40° F or lower. Allow approximately 24 hours in the refrigerator for every five pounds of turkey. For example, an 18-pound turkey will need 3-4 days in the refrigerator to thaw. A frozen turkey can also be thawed in cold water. Change the cold water every 30 minutes. A 12-pound turkey takes about six hours to thaw in cold water. A large bird (20 to 24 lbs.) takes about 12 hours. A properly thawed turkey can be kept in the refrigerator for an additional one to two days before cooking. Do not thaw frozen turkey at room temperature, because the higher temperature promotes growth of disease-causing bacteria. Microwave ovens can be used to thaw a turkey, but only if the manufacturer's instructions are followed for the size of the turkey, minutes per pound and power level needed, since each microwave oven varies. If the microwave is used to thaw the turkey, cook it immediately after thawing. Once thawed, remove the turkey's neck and giblet pieces. Wash the turkey thoroughly inside and out with cold water. It is safer to cook stuffing outside the turkey because a stuffed turkey takes longer to reach the proper cooking temperature. If stuffing is cooked inside the turkey, stuff the bird very loosely. To help prevent foodborne illness, be sure to wash everything that comes into contact with the uncooked turkey with hot, soapy water -- including hands, sink, cutting board and utensils used to prepare or stuff the turkey. 325° F or higher. A thoroughly cooked turkey, as well as stuffing, must reach a minimum of 165° F before being removed from the oven. The juices of the turkey should run clear. While pop-up timers give some indication of "doneness", it is recommended that the temperature be checked in several parts of the bird with a regular stem type food thermometer. An Inadequately cooked turkey is the main reason that roast turkey causes illness. Let the turkey stand 20 minutes before carving. If stuffed, remove the stuffing from the bird and serve it in a separate bowl. Everyone looks forward to leftovers. Remove leftover turkey from the bone, and refrigerate it, stuffing and gravy within two hours of cooking. Use leftover turkey or stuffing within three days and leftover gravy within 1-2 days. Improper cooling and reheating are major causes of foodborne illness in addition to insufficient cooking. For more information about food safety please contact the Nassau County Department of Health Office of Food Protection between 9:00 a.m. - 4:45 p.m. at 516-227-9717. Subject: LongIsland.com - Your Name sent you Article details of "Mangano And Eisenstein Offer “Turkey Tips” To Safely Prepare Your Holiday Meal"